While the multimeter is the most well-known device for measuring electrical currents and is in every electrician and HVAC’s toolbelt, a lesser known tool with even greater functionality is the oscilloscope. The oscilloscope is most commonly found in technicians working with electronics equipment and for engineers working on complex electrical systems. While an oscilloscope was often difficult to work within the past with the analog modes as it couldn’t store any data, the digital oscilloscopes are now outpacing the analog versions and even far outpaces that of a digital multimeter. You should understand first that buying an oscilloscope may sound like a great choice due to its extended functionality, it is quite large and often is only used under rare circumstances, so be sure to understand it first before investing too much into it. Additionally, the oscilloscope is complicated and difficult to use without proper training and understanding of each of the functions on the face panel of the meter. Let’s review the best Oscilloscopes that we suggest and then break them down into different categories so you can choose the best one for you. Here’s a break down of all 6 models we’ve selected as the best Oscilloscopes of 2018 including details about their features, benefits, and shortcomings. By far our #1 choice for a digital oscilloscope on the market right now and it has been year after year. While the price definitely is higher than most, it is worth it on every level. This device was developed to produce very high-end results but yet still in a compact case making it easy to travel with to different locations. The DS1054Z has a 7-inch LED display which is a perfect size to view multiple results on one screen. It also is made of high quality and does not distort or lose visibility from different angles like other models and as you know, a common complaint from multimeters. There are 4 channels on this device which should be more than enough. This Rigol device comes with 12 mpts which are expandable up to 24 Mpts which we highly suggest you do with a simple license key from the manufacturer for that extra bit of space. It also has a 50 MHz bandwidth which is more than enough to get the job done and can take 30wmfs. What we love about this device is you can insert a flash drive into the USB port to export data. The case is made of a heavy-duty hard plastic which ensures it’s not only scratch resistant but also helps to protect it against small damages. We always advise securing the device in place whenever you’re working on a site to ensure it does not drop or get scratched as it can damage the internal systems which may throw off your results. The process for resetting this product to the system defaults and calibration can be difficult to do without a professional repair person. The Singlet SDS1052DL is a powerful device which has quite a few good features with an extremely high accuracy rate based on our tests completed. It also doesn’t have as steep of a price hike as some of the other models, but yet still offers a good quality device. This model is great for engineers working on servicing electrical circuits that need to make repairs. We suggest this model for those looking for a device to use in a work environment for a professional application. The thing I love about the DSD1052DL model is it comes with a very large screen with 8×18 grid divisions which allows you to zoom in on the specific frequencies in greater detail which helps in troubleshooting. While it’s a bit of a large unit in terms of size, it still has a very fast response rate and is built with strong high-quality materials both on the outside and on the inside. We expect this device to be used for a generation with proper care. The range of this device is between 10-50 MHz and has 2 channels that can be set. It comes with 2 probes and has a USB cable so you can export the data externally for proper troubleshooting. The compact SainSmart mini DS0203 is a handheld digital oscilloscope and is perfect for quick on-the-go electrical engineering tasks. This is a great choice for technicians who need to travel and get quick readings on electrical circuits. The DS0203 has a built-in 2MB USB internal disks storage for easy exporting of data to your computer. The small device doesn’t take long to understand the interface to use the tool and it is adaptable with user-created applications as well. This device allows for software updates which will greatly improve the performance over time, however, please look for instructions online on how to update it as the user manual does not cover this. You can also find the user manual online if you misplace it. The DS0203 can measure up to 72 Mtps and an 8MHz bandwidth. It also has 4 channels, 2 analog and 2 digital for observing different electrical signal voltages and currents. All functions unlocked without the need to pay extra to the company. The SDS1202X-E series is a really powerful device that offers premium test capabilities with a 200MHz waveform capture rate with almost 100k wfms which is extremely good. While the price may be quite high, the abilities that this Siglent device can perform definitely outweighs any price you may pay. If you’re looking to record high amounts of memory with many Mpoints, this is your device with up to 12Mpoints of waveform recording. Internally the hardware is built with the best quality standards you can expect which means the processor over-delivers results quickly and accurately no matter what measurements are being done. The history function of the SDS1202X-E can record up to 80,000 frames of a waveform and allow you to easily access the information from the command prompt. Siglent developers do not believe in holding back functionality on their oscilloscopes, so all functions are unlocked for you upon arrival without the need for additional payment. The DS05072P is a great digital oscilloscope for the hobbyist looking for good functionality without the steep price hike on some of the other meters. This meter is also great as it comes in a compact size and just under 5lbs in weight with a built-in carrying handle on top for good portability. This oscilloscope gives you a bandwidth of 70 MHz of measurement along with 2 channels so there is a high level of versatility to this device for the serious hobbyist looking to do their own electrical circuit measurements. It also has some great trigger modes to help you identify the exact results including width/line selection, slope, overtime, edge/pulse, and many more. This meter also has a 7-inch display giving you plenty of screen space to investigate fluctuations. Also built with a durable hard plastic that is scratch resistant along with grips on the bottom to prevent it from sliding and moving while doing measurements. How to choose Best Automotive Oscilloscope? An oscilloscope is one of the most important diagnostic tools for an automotive engineer looking to troubleshoot sensors, ignitors, communication streams, actuators, audio, and other electrical circuit signals in a vehicle. Often, you’ll hear these called an automotive lab scope or motor tester but they are still oscilloscopes. Why don’t you use a multimeter? Automobiles often have many different electrical signals running through it and they all run off one motor/battery so the signals can often change quite rapidly making the multimeter not the best choice for understanding circuit flows over time. A few important things you should know when selecting an automotive oscilloscope. You shouldn’t utilize your oscilloscope as your scan tool as you often need to use both tools at once. Additionally, the functionality of an automotive oscilloscope is much different with less functionality but with higher automotive precision. A scan tool will have a lot more functionality which really is not needed on an automotive scope. What should you look for in your automotive oscilloscope? Can it visualize the ignition spark process? Are there pre-set functions already built into your oscilloscope? Can you change the pre-set functions and edit them for different uses in the ignition, temperature sensors, etc. Can the oscilloscope output data into a format compatible with other scopes? Handheld versus PC oscilloscope? If you are going to be only located in the workshop, you often don’t need the portability and you can use a PC scope which will give you much more functionality and a bigger screen. If you’ll be needed in the field, then you’ll want a handheld version. How many channels does it have? Two and four-channel oscilloscopes are the most common but it can go up to 10 channels. While having more is better for more complex comparisons, 2 will often do just fine but 4 would be the best case as you normally won’t need more than that. The probes and input ranges of an automotive oscilloscope are important. You should look for one with a complete accessory set that will allow you to perform high voltage measurements on injectors and ignitions. To do this, you’ll need to have the ability to extend the input range with certain probes and it’s important that the probe should be able to exceed the bandwidth of the scope. What is the warranty period of the scope and how can you get it repaired if necessary? Overall, our best choice for an automotive oscilloscope is the Hantek 1008C which is an 8-channel scope designed specifically for automotive testing purposes. This is a PC oscilloscope but can be used for off-site work as it is powered by a USB port. It can easily and efficiently diagnose ignitions, exhaust, starters, sensors, camshaft, distributors, throttle position, and so many more circuits. There are quite a few USB digital oscilloscopes on the market and for even as little as $50 you can get a pretty solid device made from the strong aluminum material. Simply connect the device to the USB power supply of your computer and use the probes that come with it and you’re good to go. Most systems only work with Microsoft Windows operating system, but it’s best to ensure you check what the software system requirements are before purchasing it so that you know it works on your device. When we reviewed many of the USB oscilloscopes, a very affordable one that we found was the Hantek 6022BE 20 MHz meter. The device is very sturdy build with rubber shock bumpers on each end to protect it. It also comes with an installation disk or you can also choose to download it from the manufacturer’s website including the most current software updates available. The HT6022BE is very affordable and while it definitely won’t give you the same results as a $300 machine, but if you don’t have a scope and you’re in a bind this is a perfect choice. It can measure up to 20MHz with 2 channels and a max sample rate of 48 MS/s. While the more expensive standalone devices are definitely the top of the line, for most jobs a simple UBS oscilloscope can do the same work at a much cheaper starting price. Don’t rule out the USB versions for your shop. How to choose the best oscilloscope for a hobbyist? Over the years as electronics have grown to be one of the largest industries around the world, the circuitry is now leading a close second to a popular and necessary skill desired in every country. While some go to college and study more professionally to be able to understand, diagnose and repair circuits, there are others of us out there who prefer to learn on our own. We are called hobbyist and overtime of tinkering with circuit boards, we may learn up to the levels of professionals. If you’re getting started as a hobbyist electrical engineer, you’re going to need an oscilloscope. What are the things you should look for when considering the best oscilloscope for a home hobbyist like you? Channels: How many input channels do you need and does the scope match that? It can range from 1-10 typically, but most of the standard scopes have either 2 or 4 as that is the most common use. If used in automotive or complex circuits, you may need up to 6-8 though. Frequency Bandwidth: The frequency range of your scope is important as you should have at least 4x the bandwidth of the highest frequency signal you’re measuring to capture it effectively. Probes Types: While your scope will typically come with some probes, you may need more or replacements (or different ones) so make sure the probes match the device and when possible use the same brand of probes as your device. Waveform Rate: The sample rate of the scope is important with a higher rate being better than a lower. The higher the sample rate is, the higher details and quality you’ll receive. Scope Capture Length: This determines how much detail can the scope store on the device before it’s full. The greater the length the more details you can store. Applications: Most devices will have certain applications installed to help you, but check if they have user-created applications and downloadable applications that you can use to enhance your scope. While there are so many great oscilloscopes on the market, the best one for the hobbyist that doesn’t have an insane price tag but still has all of the great features you will want to complete most tasks is the Hantek DSO5202P 200MHz, 2 Channel Digital Storage Oscilloscope. For under $300 you can get this device with many great accessories and a 3-year limited warranty. What is the best oscilloscope for the money? If you’re looking for the best oscilloscope for the best price, you’ll need to understand what you’re getting first so you understand the value for your money. When you look at the long list of oscilloscopes available you’d think right away that the higher the price, the better the device. Like with all things, the price doesn’t always dictate a better functionality. Oscilloscopes observe electrical signals such as frequency, amplitude, distortion and time intervals and typically are in a digital form, although the older models can be found in the analog form. You can also find different oscilloscopes that are low-cost and pocket-sized that are mostly manufactured in China and are typically for beginners. You’ll also find some handy PC/USB based scopes which can do much of what a normal oscilloscope can but instead using your computer screen. The PC based ones are usually available at a lower cost and are great for students and those who don’t need the flexibility of movement. But when it comes to getting the best scope for your money, I definitely suggest getting the Rigol DS1102E Digital Oscilloscope. Upon getting this scope you’ll notice right away that it’s very well made having a clean feel and sturdy hardware on it – and it’s quite an attractive model compared to others. While some have complained that the cooling fan can be heard, we don’t buy oscilloscopes for their silence – we buy them for their functionality and this scope has so many great functions! The DS1102E has incredible accuracy and delivers a faithful representation of signals measured. It also has the ability to trigger any signal in a predictable manner within the limits of this scope which is extremely beneficial. The storage on this device may be the best for those looking to capture long waveforms. While multimeters were all the rage for many years as they are an excellent way to measure DC signals and other AC signals, eventually if you’re working in the electronic engineering field, you’re going to need an oscilloscope to visualize the waveforms over time. In the multimeter space, Fluke is the primary winner of all meters in terms of the best of the best. In the Oscilloscope space, there is much more competition and the brands are definitely all quite great. I’m going to break down the brans into 2 different categories below primarily based on quality and affordability. What is an oscilloscope used for? Oscilloscopes are very similar to multimeters but with one addition – time. If you think of a heart rate monitor, it shows your heart beat over time showing that as the seconds continue, when does the heartbeat. An Oscilloscope is very similar to this in that it shows the electrical current over a time duration showing the ebbs and flows of electrical currents. Every device that uses electricity has a specific voltage or current level requirement and too much or too little and the device won’t work, or worse, it’ll get damaged or start on fire. If you think back to the heart rate monitor, if your heart has a murmur and isn’t beating properly, we all know that’s a bad sign. The same with electrical signals we don’t want there to be any glitches or fluctuating signals either. The oscilloscope helps us find these by understanding how the current is flowing over time and lets us know if it’s on track or fluctuating too much off track. The most common people that use an oscilloscope are electrical engineers working in manufacturing, research, development or electronics diagnosis/repair. What is the basic purpose of an oscilloscope? The oscilloscope’s basic operation displays voltage/current over time. The voltage is on the vertical axis and time is on the horizontal axis similar to that of a heartbeat monitor. By measuring this way, it allows you to check the circuit’s signal and if it’s working as you’d expect it to be both in frequency and intensity. The great thing about an oscilloscope is that because it’s showing the voltage over time in a visual representation, you can see any fluctuations in it even if for a split second so you’ll know where there is an issue or anomaly in the signal. Oscilloscopes are incredibly useful and versatile measurement tools used by people of many different trades. If you’re into the automotive space, technicians use it to diagnose many of the electrical problems in the ignition, audio, etc. If you’re in research or teaching you’ll use oscilloscopes to learn how electrical currents work. Military, aviation, and cell phone industries all use oscilloscopes to test their signals in both cell and radar communication systems. There are so many people that use it, but at the end of the day, it all revolves around the same basic concept. What does an oscilloscope measure? The primary purpose of an oscilloscope is to show electrical signals over time to determine if it is behaving properly. It is primarily used by people working with electronic devices such as computers, televisions, phones, and other electronic equipment. Typically, an electrical engineer uses an oscilloscope to perform different measurements. Phase Shift: The total amount of horizontal translation between two different (identical) waves. Frequency: The frequency is simply the total number of times that a signal repeats itself each second. Amplitude: The amplitude is basically showing the peaks in terms of the displacement of the signal over time. It is measured in two ways, the peak and the mean which means the highest and the average. Period: The measurement of periods shows you how much time in seconds that pass before a wave repeats itself. On the other side of the electrical signal measurements is the waveforms. The waveforms that come out of a certain circuit will tell you quite a few details about the circuit like if there are variations, spikes, or if it remains constant (best case scenario). Pulses: The pulse waveforms usually form when you have a constant signal and then a sudden drop which causing the signal to temporarily fluctuate. It is often not regular and happens in short but sudden intervals. Square/Rectangular: These types of waveforms have regular jumps of high and low segment pulses showing similarly to that of a bar graph when visualizing it. Sine: The most common waveforms associated with AC sources like those in the outlets of your home do not have a constant peak or fall and typically looks like hills on a map. Triangular/Sawtooth: These types of waveforms typically ramp up in signal and then ramp down creating peaks and valleys. Complex: This can be a combination of any of the above 4 signal sand they may not be in any specific order or rhythm. The main purpose for having these signals and waveforms is so that you can measure and test different circuits, devices, and instruments to display one of these for troubleshooting and diagnostic purposes. If, for example, a specific amount of energy is supposed to be flowing through a device, but the oscilloscope shows that it does but at interrupted intervals, you’ll know it’s not behaving properly. When checking different waveforms, you can see if the signal is being outputted correctly from the component. The great thing about an oscilloscope is that it can do more than just measure the voltage over time. It comes equipped with multiple input/channels which each are independent of the other. This means you can connect the oscilloscope up to as many different devices as you have channels (each oscilloscope has a different # of channels). This is great when you want to compare different devices that are performing differently. Normally an oscilloscope works by operating the different knobs and buttons on the front side of the device by the screen. Some scopes, however, you will connect it to your computer (especially high-end ones) or some have a built-in computer processing system to help you out. When you first start to use an oscilloscope, you may be completely confused, and that’s normal but the basics are easy to learn. To start, check that the input channel you’re using is turned on – you can press the default setting button is there is one. Then you can press the autoscale button which will automatically set the vertical and horizontal scales for you so you can view the waveform on the screen. If there ever comes a time that you lose your waveform, you can follow these two steps in order to track it down. These controls will be marked as “vertical” on your device and allow you to control the vertical aspects of a display. This is typically the number of volts being displayed by quantity. If you want to zoom in on the wave being displayed simply decrease the number of volts and if you want to zoom out you’ll increase the quantity. The horizontal controls are also grouped and marked “horizontal” on your device and they allow you to make adjustments on the horizontal scale which is typically the time duration that goes by on the screen. Similar to the vertical controls, decreasing the time enables you to zoom in on a shorter duration of time and increasing it allows you to see waveforms over a longer period of time. In a normal situation, even if you’re using a digital oscilloscope, you are measuring analog signals converted into a digital space. But many people don’t understand the power of the oscilloscopes today in that they can produce both the raw analog signals along with the digital ones. The great thing about this is that it expands your ability to test and analyze signals. The great thing about a mixed signal scope is that it combines much of the complex logic and analysis needed to combine signals in the background eliminating the need for you to do it and displays it in a user-friendly format. Onscreen you can see all of the digital signals and analog signals on-screen all at once which is incredible. Typical devices will have around 4 analog input signals and up to 12-16 digital signals which are a lot of inputs. What is the difference between analog and a digital oscilloscope? There are two different kinds of oscilloscopes, analog and digital. I’ll break each of these down separately below. When oscilloscopes were first created, they were all analog which uses a system of cathode-ray tubes to display the waveforms on the screen. This used different phosphor to illuminate the screen when there is an electronic current. This was how you would be able to see the changing behavior in patterns of your waveforms. Analog oscilloscopes can be useful as the signals don’t disappear right away after they start a new round which is nice so you can see them overlapping at times, however, the downside of using an analog oscilloscope is that you can’t stop or store any of the waveforms that appear. Once the lamination dissolves again, the data is lost and you have to capture it again. Analog oscilloscopes are very manual to use and have very limited functions. A digital oscilloscope (digital storage) was created just to remedy this issue of being able to keep and store data. Instead of the phosphorous screen used in an analog device, the digital scope uses an analog-to-digital converter that digitizes the incoming signal and stores it to memory. The devices look for the trigger events to happen over time and stores it to memory while the scope’s processor performs any specified processes to the signal before it is displayed on the screen of the oscilloscope. The great thing about having the data in a digital format is that it allows you to conduct many different types of measurements on the waveform and the signal can be stored indefinitely in the memory (space allowing). You can also transfer the data from the oscilloscope’s memory to a flash drive or in some cases connect it directly to your PC so you can control and save it. What are the advantages of an oscilloscope over multimeter? The biggest difference between an oscilloscope versus a multimeter is time as we said before. A multimeter can take a current measurement of volts/signals, but an oscilloscope can take that same measurement constantly and display it over time. A multimeter can’t understand waveforms and determine signal variations over time as it typically gives you the mean value of a signal as it currently is being displayed. The oscilloscope can show you the exact waveform shape including the voltage and frequencies of that waveform which is vital when diagnosing problematic circuits. If you’re on the market to step up your electronic analysis and troubleshooting capabilities and you’ve had a multimeter for some time now, maybe it’s time to give the Oscilloscope a try. This device is a game-changer for electricians to diagnose problems in circuits and you’ll never regret it! 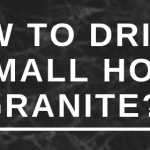 How to drill a small hole in granite?